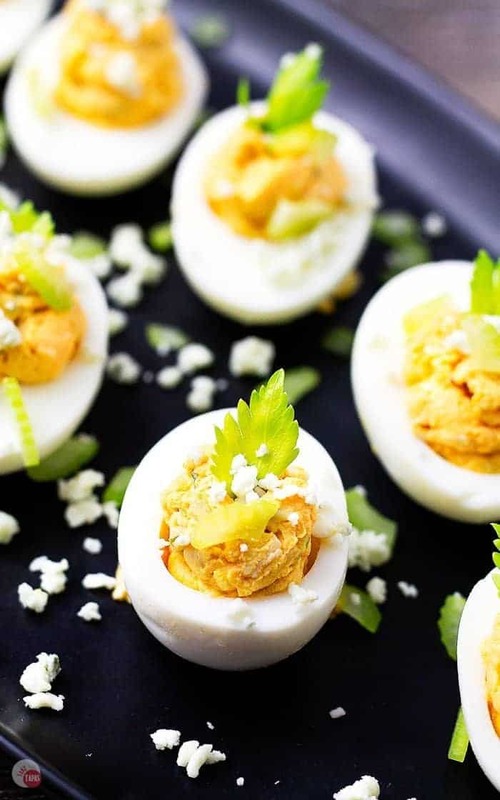 These buffalo chicken deviled eggs are full of shredded chicken, spicy hot sauce, and tangy blue cheese crumbles. The perfect finger food for a party! When you are looking for easy appetizer recipes, what do you normally think of? A make-ahead dip, something you can whip up in less than 10 minutes, or how about something you can make with ingredients you already have on hand so you don’t have to run to the store? 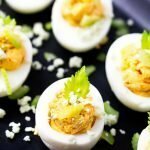 For me, it’s all three of these requirements and that’s exactly how these deviled eggs stuffed with spicy buffalo chicken came about! Seeing as how our family eats tapas and appetizers most of the time, I tend to keep things on hand that I can use to whip up something fast and delicious. Ingredients like shredded chicken, a few dressings, browned ground beef, puff pastry, tortillas, cream cheese, and of course, hard-boiled eggs. 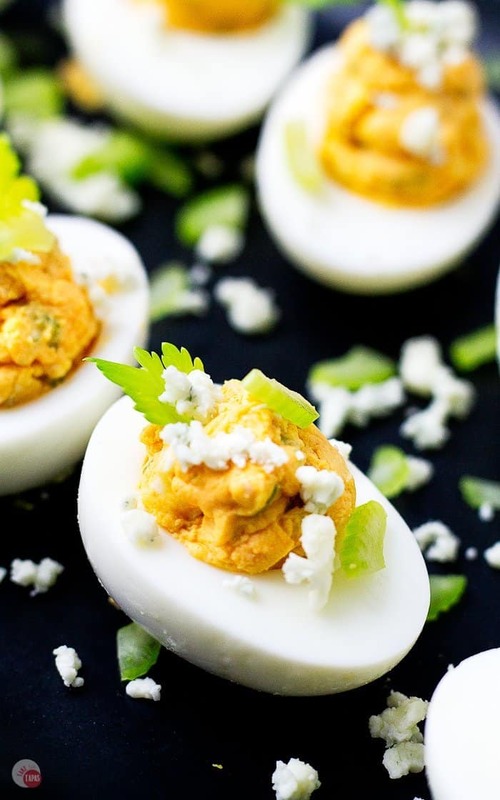 Just take me to the Buffalo Chicken Deviled Eggs Recipe Already! If you’d rather skip my (very helpful, I think) tips and tricks, essential cooking info, and similar recipe ideas – and get straight to this delicious easy Buffalo Chicken recipe – simply scroll to the bottom of the page where you can find the printable recipe card. How do you make Buffalo Chicken? Buffalo chicken is one of those universally popular flavors, much like ranch or sweet and sour. I can see why, because it hits all the right flavor notes: salty, tangy, and spicy. Not only is it easy to make yourself, but you can usually find the sauce already made at the store. I like to make my own buffalo sauce for the buffalo chicken because I like to keep the additives on the low side and I want to control the level of spice. Meaning I like it hot! Making buffalo chicken is easy, just a simple mixture of hot sauce and melted butter tossed over some shredded chicken. Sounds super easy, right? Of course it is. I’m sure you have some chicken either in your fridge or freeze that is just begging for some buffalo sauce right now! Q: What can I use if I don’t like blue cheese? A: Feel free to leave out the cheese or you can add a little feta for added creaminess! A: Yes, you can. You can make it up to 3 days in advance just be sure to stir it up before you add it to the eggs. Q: Can I freeze these? A: I would not recommend freezing your eggs. Q: What can I substitute for mayo? A: Feel free to use an avocado in place of the mayo, or even a little sour cream! Ever wonder why are they called deviled eggs? The term “deviled” was used to describe spicy foods or foods with some zest. Meaning they were made with hot spices or something as simple as mustard or black pepper! I don’t think that these things are all-together “devilish” but I do like hot foods so I am a little biased. 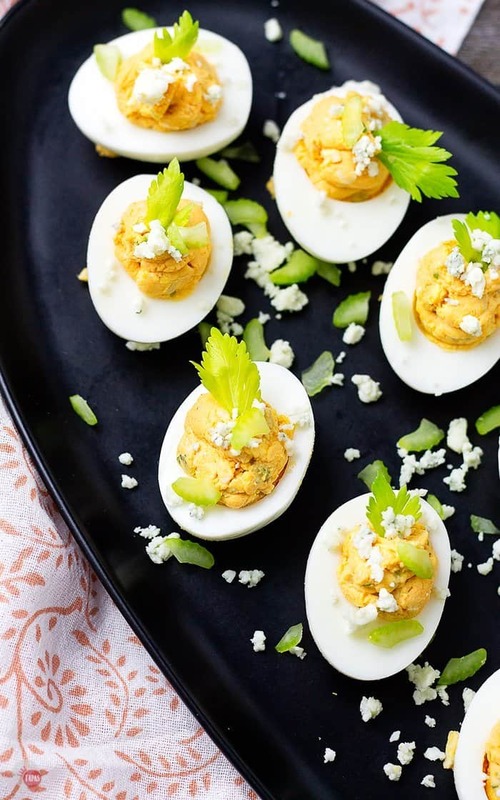 To make these Buffalo Chicken Deviled Eggs, hard-boil your eggs as you normally would, cool, and remove the yolks. Or if you are in a rush, you can buy cooked eggs, already peeled, at the store. Mix the yolks with the spices, hot sauce, and mayo. Fold in the shredded chicken (a rotisserie chicken from the deli works great in a pinch) and add in your blue cheese and celery. Add to your piping bag or use a scoop to fill the egg white cavities. Garnish with blue cheese crumbles and celery leaves if desired. 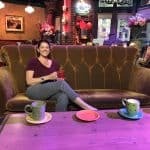 Serve cold! 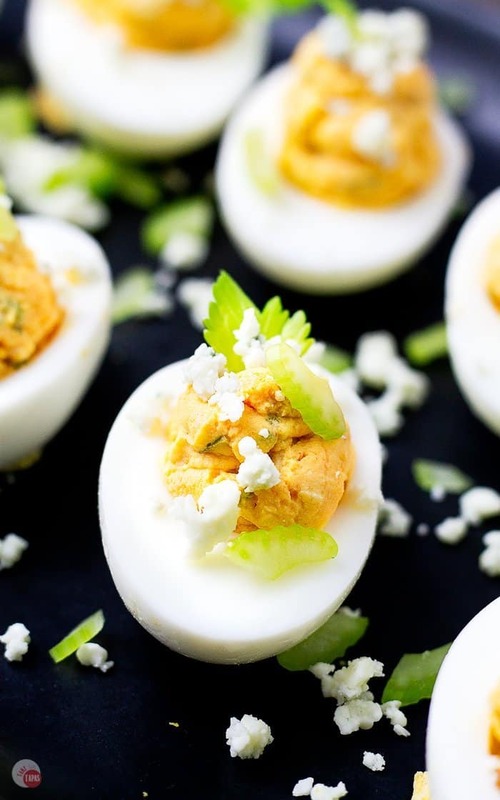 These buffalo chicken deviled eggs are a great appetizer to make for a crowd and are sure to be a hit at your next party! Other great Buffalo Chicken recipes to try! 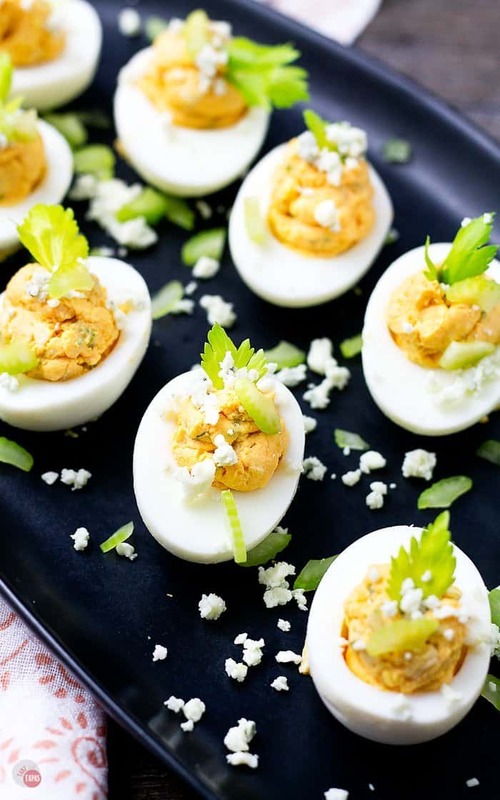 Looking for a deviled egg recipe to take to a party you’ve been invited to? Check out all my deviled egg recipes, both sweet and savory, to fit your special occasion! 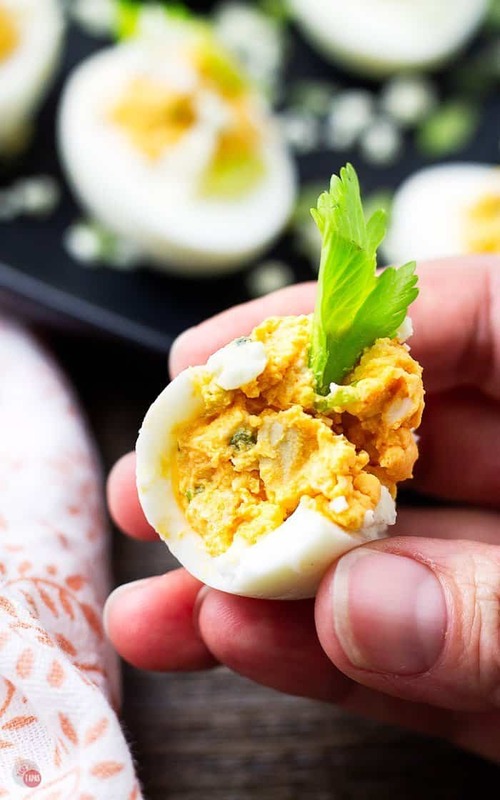 If you love this Spicy Buffalo Chicken Deviled Egg Recipe as much as I do, please write a five-star review in the comment section below (or on Pinterest with the “tried it” button – you can now add pictures into reviews, too! ), and be sure to help me share on facebook! Hard-boil your eggs and cool down. Peel and cut each in half, removing the yolk to a separate bowl. Save the whites for later. In the bowl with the yolks, mash the yolks. Add the mayo, hot sauce, and half the blue cheese and celery. Fold in the shredded chicken until fully mixed. Add to your piping bag or use a scoop to fill the egg white cavities. Garnish with blue cheese crumbles and celery leaves if desired.